Exactly one year ago today I was with the family in the Christensen vacation home in Skåne (Southern Sweden) and posted a blog post titled The Euro – A Monetary Strangulation Mechanism. I wrote that post partly out of frustration that the crisis in the euro once again had re-escalated as Greece fell deeply into political crisis. One year on the euro zone is once again in crisis – this time the focal point it the Italian banking sector. So it seems like little has changed over the past year. After nearly eight years of crisis the euro zone has still not really recovered. In my post a year ago I showed a graph with the growth of real GDP from 2007 to 2015 in 31 different European countries – both countries with floating exchange rates and countries within the euro areas and countries pegged to the euro (Bulgaria and Denmark). I have updated the graph to include 2016 (IMF forecast). The picture is little changed. 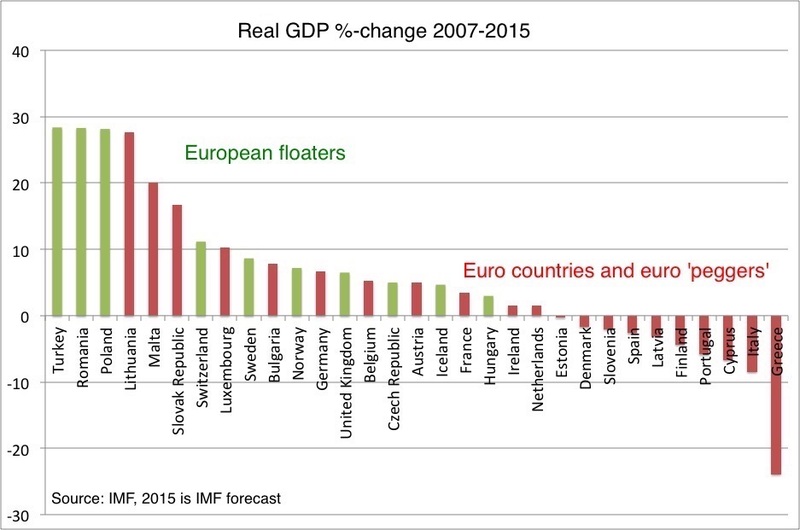 In general the floaters (the ‘green’ countries) have done significantly better than the peggers/euro countries (the ‘red’ countries). That said, I am happy to admit that it looks like we have had some pick-up in growth in the euro zone in the past year – ECB’s quantitative easing has had some positive effect on growth. However, the ECB is still not doing enough as new headwinds are facing the European economy. Here I particularly want to highlight the fact that the Federal Reserve – wrongly in my view – has moved to tighten monetary conditions over the past year, which in turn is causing a tightening of global monetary conditions. Second, if we look at the money-multiplier in the euro zone it is clear that it over the past nearly two years have been declining somewhat due in my view to the draconian liquidity (LCR) and capital rules in Basel III, which the EU has pushed to implement fast. Furthermore, given the increase in banking sector distress in the euro zone recently the euro zone money-multiplier is likely to drop further, which effective will constitute a tightening of monetary conditions. If the ECB does not offset these shocks the euro zone could fall even deeper into a deflationary crisis. If you are interested in what I think should be done about it have a look here and here. Concluding, the monetary strangulation in the euro zone continues. Luckily, again this year at this time it is vacation time for the Christensen family so I will try to enjoy life after all.